Translating your global brand into context based languages can cause a lot of headaches. Take for instance the example of using adjectives in French. Adjectives are words that describe the noun. In English, adjectives are pretty simple. You place the adjective in front of the noun and you are done. And they work in context regardless of the noun. One example we had to work with recently was the term “water repellent”. You can have a water repellent raincoat, water repellent shoes, water repellent mesh. The adjective remains the same in English. However, in French, adjectives change based on gender (Masculine or Feminine) and whether the noun it describes is Singular or Plural. And while most adjectives come after the noun in French, some are placed before the noun. Adjectives that come before the noun are also sometimes subject to change when the adjective ends with a vowel and the noun changes begins with a vowel or a silent “h”. Not every adjective can be made feminine by simply adding an e and not every adjective can be made plural by adding an s. To make matters even more complicated, there are also irregular adjectives that do not follow the same pattern as other adjectives. A great overview of the use of adjectives in French can be found here. Simply put, context and gender based languages can be very unpredictable when translated from an English perspective. We’ve written before how context specific languages can impact your brand in translation. In fact, gender and context specific languages are our number 1 and 2 tips in our list of 5 tips for the Global Marketing Manager. Here are two examples how context and gender based languages can cause issues. Ignoring Context in Translation – Global Brand Manager beware! 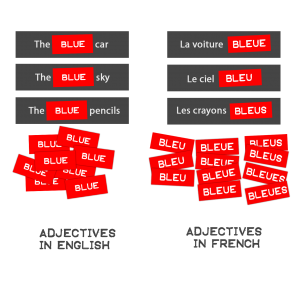 Because adjectives are simple in English, there is a general expectation that it is the same in French. Here is an example where project management and experience in translation services counts. Simply translating an adjective alone looks easy. However, most of the time one word translations are relatively some of the more complex jobs in translation. Let’s continue with another example. The translation for water repellent in French (for Canada) is “hydrofuge”. But an experienced global brand manager will want to find out more about this word and how it is used. In one of our recent projects, it was a word for a hangtag describing shoes. With “shoes” as the noun, the adjective needs to be plural as well. In context, it would be “chaussures hydrofuges”. In English, whether you say water repellent shoe or water repellent shoes, the adjective doesn’t change. While this seems like a very small detail, translation accuracy is often impacted negatively because of the assumption that English grammar can apply the same to translated work. Be careful on your end that your designer or marketing manager does not reuse past translations and cobble them together without having them reviewed by the translator! A simple exchange of the plural for the single noun can leave you with an inaccurate translation and a dilution of your brand. Another example we encountered is in the use of context specific language in slogans or repetitive advertising. Context based language can really be problematic when applied to different products. One often used slogan in English is the “Only (available) at [company]”. One client decided to go with a more generic “Seulement vendus ici” in all their advertising (only on sale here). If the sale refers to products that in French are masculine, no problem. The issue here is the noun vendus (sale). When we talk about products, that terminology is Feminine. We will need to change vendus in this case to vendues. Without due diligence on the review and approval of the French, the reuse of such a slogan could result in a lot of mistranslated materials. Designers often come up with clever ways to use and reuse single words. However, if the word “hydrofuges” were to be used to describe another product that is singular, the word would be grammatically wrong. Placement is also often an issue in design because grammar in other languages may not be as predictable as English. A design piece that highlights certain words can require a complete redesign in order to get the same effect. In the case of French adjectives, you have an additional problem that most adjectives are placed before the noun. Especially in bilingual design, this can become problematic. Often we see a bilingual piece of text associated with a logo. However, when you associate an adjective, such as comfort, and associate it with the brand logo, you cannot simply make comfort bilingual. However, in French confort would be placed before the [NAME]. This is not going to be pretty in bilingual format and would have to be modified. We understand that organizations may want to look carefully at their budgets and decide to reuse translated materials. Why would you pay twice for translating the same word? Imagine if we translated only the words “water repellent” and “comfort” in our earlier examples without checking context and gender. It may sound like a red flag after reading this blog, but it is our experience that context is often overlooked on the client’s end when they want to reuse translations they have. Even a seasoned translator may forget to take into account context if the request is simply to translate one word. As we highlighted in our blog about translation costs, it takes time and a good process with dedicated project management to handle these requests accurately. Global Brand Managers should always be wary of reusing content in other languages, especially if they are context based. Think of your translation provider as a partner in your success. That’s how we partner with you.